In a small saucepan, combine maple syrup, molasses, coconut oil, vanilla, cinnamon,, ginger, allspice, cloves, nutmeg and salt. Warm just until coconut oil melts then remove from heat. 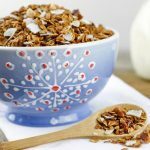 In a large bowl, combine oats and pecans. Pour molasses mixture over the oat and nut mixture and, using a large spoon or spatula, stir well to evenly coat everything. Spread granola in prepared pan and bake in 325°F oven for 10 minutes, then stir. Cook an additional 10-15 minutes, stirring every 5 minutes, until lightly browned. Remove pan to cooling rack to cool. Granola will crisp up as it cools. Stir in candied ginger and coconut flakes. When granola is completely cooled, transfer to a lidded container for storage.